One of our favorite family games to play is Scattergories. This Thanksgiving I wanted to create a version where we focus on what we are thankful for and the fun events of the holiday. If you haven’t heard of this fun game, you basically roll the die and whatever letter it lands on needs to be the first letter of each thing on your list. Don’t have a Scattergories die? Well, you can also play the “I’m Thankful For” game where you pick something you are grateful for that begins with each letter of the alphabet. 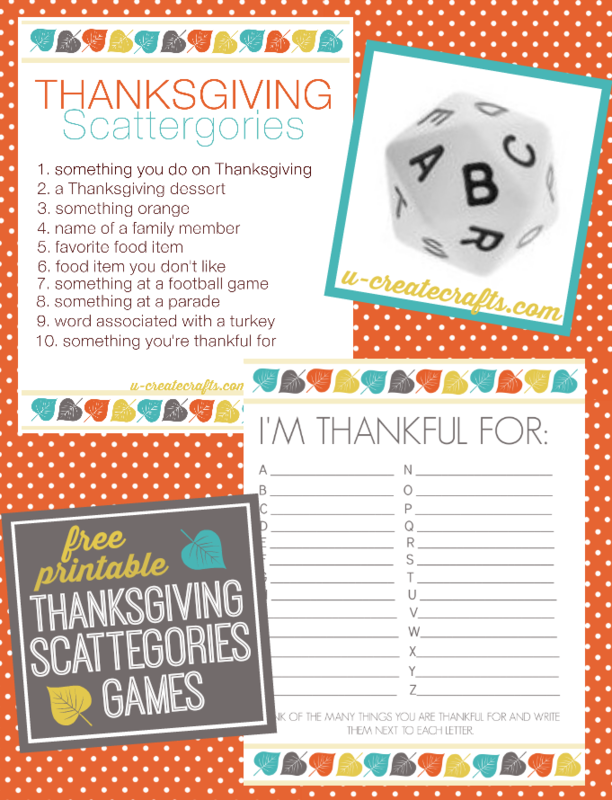 Print out the following links today for fun, family games during your Thanksgiving holiday! Thank you for creating this! My family loves Scattergories too! Oh I can’t wait to play this with my kids! Thank you creating it!! YES!!!!! We played normal scattergories for the first time a couple of weeks ago and we ran out of lists! Yay for this!!!! !